This year’s Alton Lions ‘Eggstravaganza’ has resulted in a £1000 donation to Bushy Leaze Early Years Centre. 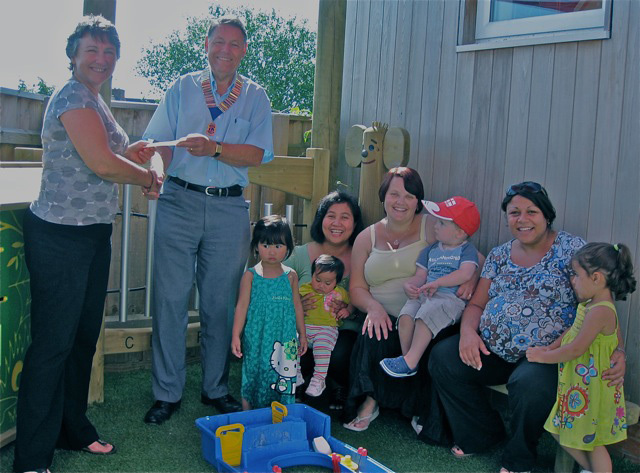 Pictured are Alton Lions President Graham Dix and Bushy Leaze Head Mrs. Patti Snook at the Centre together with happy mums and toddlers. The Centre is a nursery with 60 children attending part time with fifty per cent of the places designated to children with learning difficulties and disabilities. Bushy Leaze also supports some 500 other children and operates a baby clinic. Patti expressed her thanks to the Lions for organising the ‘Eggstravaganza’ on behalf of all the Centre’s users and said it was very pleasing to know that there was so much goodwill in the community for Bush Leaze. The donated funds will be used to further develop Outreach Parent and Toddler support groups especially to Alton’s surrounding villages.